+ 4 = eleven Required Please enter the correct value. The New York Department of Financial Services (NYDFS) created the BitLicense to ensure Bitcoin companies in the state operate within the law. While the BitLicense only covers activity within the state of New York, the attraction for having one is high given New York City's role as a world financial center. Circle was one of 22 Bitcoin companies to apply for a BitLicense by the Aug. 8 deadline. Other notable Bitcoin businesses still awaiting approval include Bitcoin wallet companies Xapo Inc. and Coinbase, Bitcoin exchanges Bitstamp and BTC China, and Bitcoin ATM company Coinsetter. "Though still not perfect, the BitLicense and its requirements became clear and irrefutable prerequisites for serving and supporting everyone in New York," Circle co-founders Jeremy Allaire and Sean Neville said in a company blog post. The first BitLicense is a big leap from where Bitcoin stood with government officials four years ago. Back in June 2011, Sen. Chuck Schumer, D-NY, and Sen. Joe Manchin, D-WV, wrote a letter to the U.S. Attorney General calling for a crackdown on the "untraceable peer-to-peer currency known as Bitcoins." But as the first BitLicense shows, attitudes toward Bitcoin have changed dramatically. 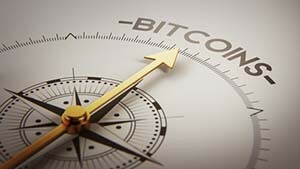 Not only are state governments and federal regulatory agencies looking for ways to accommodate Bitcoin, Wall Street has hopped on board as well. Circle, for example, is backed by $75 million in venture capital led by Goldman Sachs (NYSE: GS). Earlier this month, nine major world banks announced the formation of an alliance to study ways to use Bitcoin technology to make their operations more efficient. And the Commodity Futures Trading Commission (CFTC) ruled that Bitcoin is a commodity.